The Weather – is the flood help always appropriate? I haven’t got much personal news about The Weather. It’s been windy: the lid blew off the dustbin last week, and a bag of recycling fell over. I could hear the wind up on the hill making scary noises, but down here we’re really sheltered. Our broadband went off for five minutes yesterday. It’s also been wet: the whole bottom of the garden has filled up and the soil against the retaining wall is waterlogged to the brim. But it is a no-tread bed and the ducks can’t get in there, so it doesn’t really matter. It’ll just be nice and moist later in the growing season. 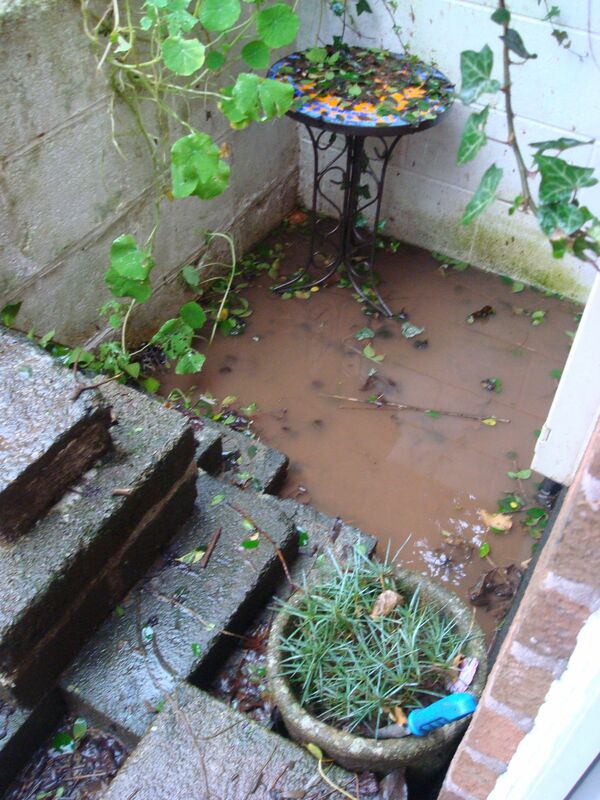 The water is still collecting in my erroneously designed step area, which can’t drain away, but it soon subsides. The paths make a bit of a sploshy noise and could do with the wood-chips replenishing, but again, it doesn’t really matter. Quite a bit of the extra water is probably attributable to my half-completed water harvesting, which still hasn’t got any overflow system and is just draining into the garden. But from a wider viewpoint, I’m guess I’m sponging up the extra water rather than it going into the drains and – what? Raising sea level, ultimately. Never let it be said that I’m not doing my bit. Totnes can’t compete with the ‘exploding sea’ on the Cornish coastline, or the ‘living in a lake’ in the Somerset levels or along the Thames Valley. There was a bit of seaweed on the grass down at Longmarsh, evidence that the river has been up a bit high, but that’s not unusual. A pot-hole appeared in the road on The Plains on Sunday, and the road was closed yesterday when a tree fell down on the Dartington road. Other people may have more dramatic stories, but I have been too busy picking up my recycling and replacing my dustbin lid to notice – oh, and watching the floods on TV. This has triggered a few concerns in my mind. Setting aside the wider and oft debated issue of climate change, and also the dubious competence of those responsible for preparing for floods (see for example The Spectator), what concerns me is who is in charge, and what inappropriate actions they will take in the name of ’emergency’. I do empathise with the indignation of people in the flooded communities who have been forced to conduct and implement their own relief operation during the period before Cameron et al got hyped into helicoptering down to have a look. It’s not right that they should be left without support, and I’m sure there comes a severity level when anyone, however autonomous or self-sufficient, welcomes help from emergency services. But I can’t help thinking that it might not be such a bad thing for the people, with their local knowledge and personal involvement, to be in charge – even if not actually doing it themselves. Yes they need resources and supplies, but let them ask for what they want – and reject what they don’t. Because it is a worrying thought that once the authorities get involved, backed with Cameron’s “money is no object” (oh yeah? How has that suddenly happened then?) and their media-spun need to ‘be seen to be doing something’, that they are just going to steamroller over local people and their land. Men are in charge, and men love diggers – and Hey presto! JCB have donated a fleet of them. Are they being deployed appropriately or are they just going to plough in with their great big machinery and mess everything up? Put a digger on saturated ground and you’re going to compact the soil and inhibit absorbtion. Do a load of indiscriminate digging and… well, maybe it’ll help someone, in the short term, but will it help in the longer term? Surely flood defences – and remedial measures – need to be planned and precise and sensitive . I haven’t seen much active opposition to or questioning of the actual remedies and measures being taken – maybe they’re doing it right, or maybe I’m using the wrong search terms. Or maybe residents don’t feel they can question the methods when they need urgent help. The problem with asking for help is that it can easily turn into a surrendering, an abdication, where those who help are liable to take over and do whatever they like, ride roughshod over the very people they are helping. How much – or how little – say are the local people having in what is done where, and how? On a personal, micro-scale, I always remember the time I had an unexplained fire start on my woodpile outside the front door. I called the fire brigade as an over-cautious precaution, because the woodpile was next to the gas meter and I thought that it was better to have them on site than to call them later, after a gas explosion. They sent two fire engines, and next thing I knew there were great big men striding down through the garden, and shouldering past me into the house, insisting I let them get to the kitchen. I had to really protest – that the fire didn’t start in the kitchen, that it wasn’t in the house at all – in fact he was walking right past it. Even then he argued with me… turned out he assumed that the wok, which was the closest, largest vessel to hand for carrying water out to put out the fire, was the culprit. The problem was, once I had called them I surrendered my authority to theirs. They had a duty of care to assess the situation and do whatever they thought was necessary, in their professional opinion, based on their assessment of the circumstances. This is sort of alright, in theory, but that still doesn’t change the facts: I knew where the fire was, I knew where it wasn’t, and I tried to explain all of it to him but he didn’t listen. He substituted his opinion for my knowledge. Why? In Westonzoyland in Somerset homes are in danger of worse flooding due to measures being taken to divert water away from Bridgewater. According to The Telegraph “An Environment Agency source said: “A 40 square mile area of the Somerset Levels could be flooded deliberately to save Bridgwater and Taunton.” A spokesman for the Environment Agency said: “This is an emergency situation and some very difficult decisions have to be made.” A woman in Somerset had a drainage ditch dug across her land to drain surface water into the river – yet her own property was left cut off and flooded on the other side. An artificial weir was created with 30 ton sandbags to divert water away from Winchester, intentionally flooding 300 acres of farmland. I don’t know whether these measures are justified, sensible or necessary, and whether due consideration has been given to alternatives, but I can’t help remembering foot and mouth and how badly that was handled by people with the power to enforce it. Ultimately, when drastic measures are being taken, it becomes more important than ever to be able to trust the people in charge. And I don’t. I simply but emphatically don’t. When the operation is being motivated by political concerns to be ‘seen to be doing something’, rather than by the genuine long-term best interests of the community and the land, I don’t have any confidence that the correct decisions will be made. Do you?